The Presidential candidate of People’s Trust (PT), Gbenga Olawepo-Hashim, has urged Nigerians to support his candidacy for rapid economic development that will lift the masses out of abject poverty, saying 70% of Nigerians voters are yet to decide who to vote for among the presidential candidates less than 11 days to the 2019 election. 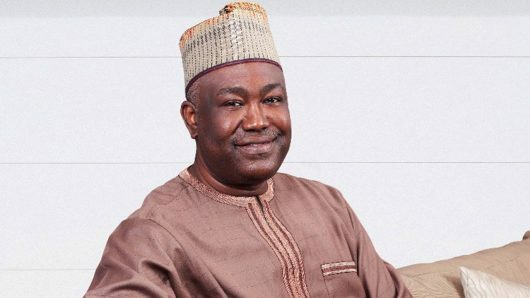 Similarly, Olawepo-Hashim said he had no plan to step down for either the APC’s Muhammadu Buhari or Atiku Abubakar of the PDP, expressing the confidence that the two candidates are beatable with their parties’ woeful performances since 1999. The Presidential hopeful who spoke during campaign in Akure, the Ondo state capital to solicit votes of the people of the state, advised electorates to reject the two political parties that had failed them and the country in the last twenty years. Olawepo-Hashim who was accompanied by his Campaign Director-General and former transport minister, Habu Fari, said the country was too endowed with natural resources for the citizenry to be wallowing in poverty and vowed to introduce policies that would end insecurity and economic hardship if elected the president of the nation on the sixteenth of this month. He advised eligible voters to secure their future by voting for his people’s trust party in 2019 election. Olawepo-Hashim assured Nigerians, especially youths and graduates that he would create jobs and make the environment conducive for businesses to flourish. The presidential candidate of PT said his party was fine-tuning its strategy in all states of the federation on how to wrestle power from the ruling APC, adding that PT had the highest number of representation in constituency nominations.